HEADLANDER: Now available on Vinyl! It is the future. It is a world of automation and pleasure amongst the stars. It is a soundtrack AHEAD of its time. 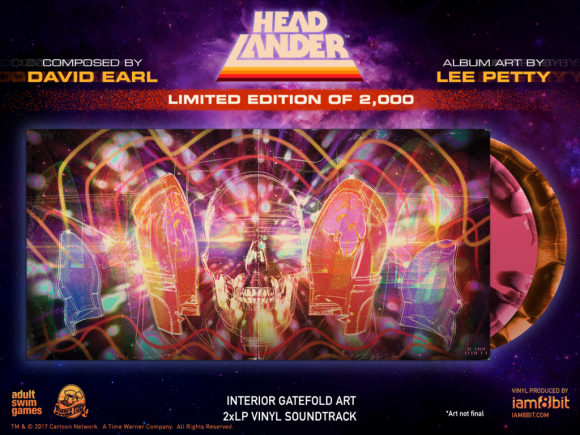 Iam8bit presents a Double Fine and Adult Swim production of the mind-blowing score to the epic, retro sci-fi adventure HEADLANDER. Composer David Earl has created an analog-synth fueled masterpiece, inspired by the electronic music of Vangelis, Jarre, Tangerine Dream, and more. From the ambient chimes of the Pleasure Port to the haunting collapse of the Computer Core, this expansive score will transport you to the future. Behold him live composing the soundtrack in this 2 Player Productions Minisode. While your EAR HOLES will be elated, your OCULAR BALLS will be indelibly seared by the album art created by writer & director Lee Petty. Featuring a full gatefold spread image, custom sleeve art and psychedelic spattered platters, it is a sight you will not soon forget. HEADLANDER. Pre order your copy today!